Memorial Stadium becomes the 3rd largest city in Nebraska on Gameday holding over 90,000 fans. Nebraska has an all-time record of 889-372-40 (.699), 5 national championships, and 53 post season appearances. The 1995 Nebraska football team has often been voted the greatest team of all-time and is still debated as being a part of the greatest dynasty in college football history. Throwing The Bones: Crossing your arms, making an X symbol after defensive stops and when welcoming the Defense - also known as The Blackshirts - onto the field. Tunnel Walk: Like many collegiate programs, Nebraska players have a specific way of taking the field before each game. The entrance starts with a Husker Power chant that is shouted back and forth between east and west Memorial Stadium. Then the team is shown, still inside the locker room and uttering the "Husker Prayer." The biggest key to the Nebraska Tunnel walk is the song. Sirius by The Alan Parsons Project rings throughout the stadium and makes the hair of every true Nebraska fan stand on end as they cheer on their Huskers. All of this creates a scene unlike any other in college sports. Shoes Off- Kickoff: During kickoffs, every member of the Boneyard removes one shoe and raises it in the air while jumping up and down before each kickoff. 3 and Out: After the defense stops the opposing team on their first three plays of the drive, each member of the Boneyard "throws the bones" combined with the “OK” hand gesture. Let Me Clear My Throat: After an amazing 55-yard touchdown run by fullback Andy Janovich against Wisconsin in 2016, Let me clear my throat by DJ Kool was played within the stadium. The song, paired with the run and an abnormally long TV break, created a raucous atmosphere within Memorial Stadium. Let me clear my throat is now played following a big play by the Huskers late in the game, sending the crowd into a frenzy. 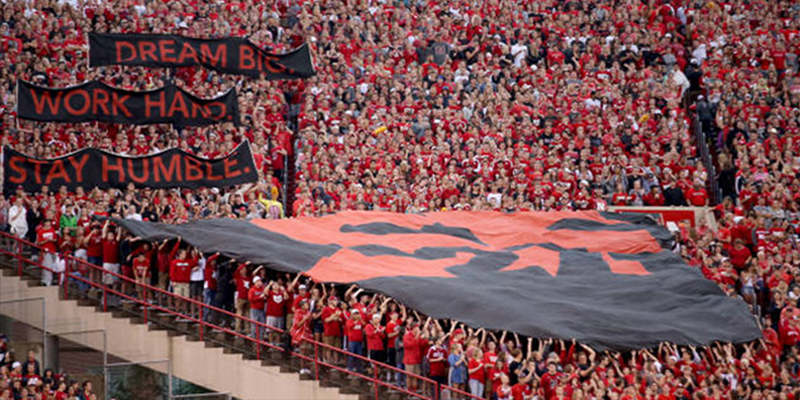 Tifos: A large canvas painting that is created by Iron N members to support the Cornhuskers. 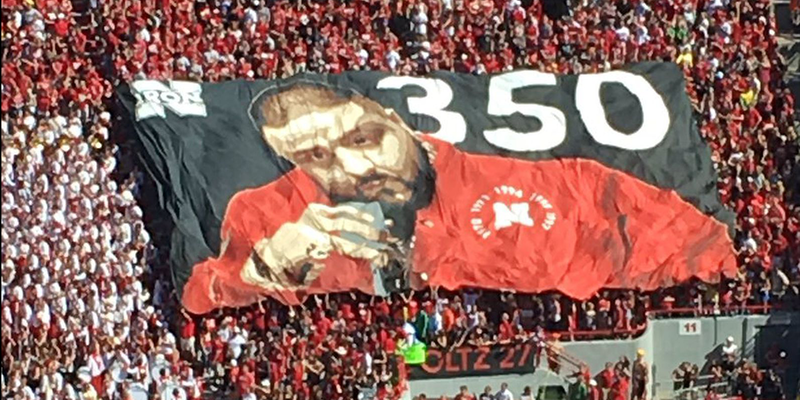 The first tifo was made in 2014 when the Miami Hurricanes were visiting. It featured the words, "Welcome to Your Worst Nightmare" along with a large skull and crossbones. 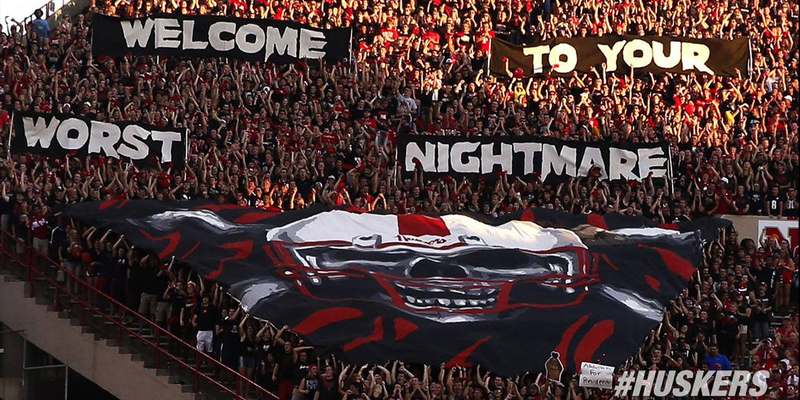 Many tifos have been made over the years, but the largest was made to commemorate the 350th consecutive sellout of Memorial Stadium and was over 3,500 square-feet of painted canvas.